Motorbike mechanic Rusnan Erces has hand built a steampunk replica of Sylvester Roper’s steam motorcycle in Indonesia. This is his third version of the bike and it is now running well. Rusnan has a blog devoted to his bike and it’s well worth a visit. It takes about 15 minutes to raise steam using charcoal fuel, bringing it up to an ideal operating pressure of 50-100psi. Rusnan estimates the bike may be capable of up to 50-75mph (80-120kph). The safety valve is set to release at 100psi to keep things safe, although the boiler has been tested to 150psi. 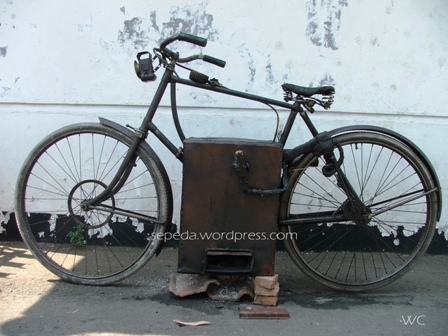 The bike can carry 10litres of water and the burner 3kg of briquettes, giving it an endurance of 3 hours continuous running in a static display. The engine appears to be a single cylinder single acting piston-valve type, and the boiler is likely a simple water tube type with a burner grate below, which can use charcoal, coal, coke or wood – it could also potentially use compressed waste paper making it a very cheap vehicle to run. The bike is an inspiration in terms of what can be built from scrap sheet metal, some motor parts, piping and an old bicycle! This is the ultimate in appropriate technology, particularly for a developing country like Indonesia. Rusnan hopes that this will be the start of a whole movement aimed at building and running steam motorbikes – he has certainly made a good start! The Steam Car Club of Great Britain has a wonderful step-by-step article on how Paul Brodie of Flashback Fabrications built a couple of replicas of Sylvester Roper’s 1898 steam bike. The article gives details of boiler construction (pages 7-8), and the feed water pump (page 4) which is driven by an eccentric on the opposite side of the rear axle from the main drive. The throttle valve is covered on page 5, while the fire box is covered on page 10 – a modernised version could run a gas or pressurised kerosene burner in that space. The steam assembly is on page 13 showing how the power system comes together to make a complete bike. This is a very detailed write-up and well worth visiting the Steam Car Club of Great Britain – and while you’re at it, why not join up too! The site, run by Jeff Theobold, has loads of information about steam cars and other steam bikes. Sydney Festival 2008 – and Shooglenifty! It was a lovely day for a motorbike ride on Saturday – overcast, cool but not much rain – just a couple of drops – so I took off the topcase – knowing that I would be bringing a backpack, tent and mandolin back from Sydney as I was meeting my daughter there. The ride was smooth and the bike behaved wonderfully well – a full tank at the Caltex Weston Creek then down Hindmarsh Drive and out past the airport. The clouds seemed to have kept the crowds away and road was quiet – in direct contrast to the bike. I filled up at Marulan and then onto the tollway into Sydney. As I was about to leave the last tunnel the engine faltered – I reached down for the fuel tap to switch over to reserve, but it died in the tunnel – a bare glimmer on the neutral light and no electric power. Bugger! I was in sight of the toll gate and pushed the bike off to the side and got the guy in the toll post to call for a tow. Actually it was just a ute with flashing lights that turned up about 30 minutes later and two guys helped me push the bike out of the tunnel and up the hill to exit. With the battery rested, I found I had a brighter neutral light so I got the guys to help do a push start and the antique bike fired up again. So without an alternator I managed to limp the bike to within half a kilometre of the hostel and pushed it the rest of the way. By now the sun was out and it was hot. I actually had to ask someone to move out of the way as the young woman was waiting for a bus and wouldn’t move despite clearly seeing me push a heavy bike up the hill towards her. I guess I was definitely in Sydney! After reaching the hostel and meeting up with my daughter Eve, I managed to get a lift from the desk guy and bought a battery from a bike shop and a charger from K-Mart and on returning to the hostel set up the old and the new battery and charged them in turn. So then to the fun bit! We were in easy walking distance of Macquarie Street where Scottish celtic band Shooglenifty was to play – the place was crowded as Eve and I did a reccy for a good position. The opening of the Sydney Festival began with a series of open air weddings which was a bit quirky, then they announced that they were putting away the chairs and clearing the barriers, so Eve and I bolted for an opening and with deft use of elbows – developed over the January Sales – we ended up front and centre in front of the stage. The warm-up band was a celtic trio plus didgeridoo who performed… accurately. They didn’t once look at the audience and so the audience largely ignored them and shuffled around. Luke on mandolin, Angus on fiddle, Quee on bass, James on drums Malcolm on guitar and Gary on banjo. This is an awesome band – Luke’s playing is to be heard to be believed – he sure can make that mando sing. This progressive celtic band from Edinburgh is just amazing. Despite the very limited space most people were dancing (at least up and down) – and there were several thousand crammed into Macquarie Street for the show. We met up with them after the show – Angus uses a Fishman pick-up on his fiddle – and we wished them well for Tasmania and then headed off for some food supplies to cook up back at the hostel – Phew I was exhausted! The next morning, with the batteries charged, I put the old one back on the bike and the new one in the pannier, and we loaded up with Eve’s stuff form Woodford festival – where she had been performing in the Fire Event and fired up the bike to head home.